Self-taught American mosaic artist Jacqueline Iskander (56) has been exploring the vast and versatile world of mosaics since 1996. 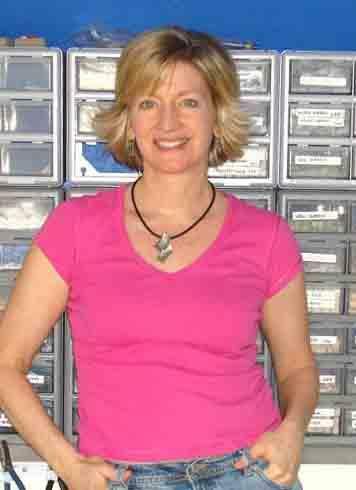 After studying computer science and being a programmer and later a system analyst for many years, Jacqueline became interested in making mosaics in 1995 when she and her husband were building a house. She wanted to have a mosaicked fireplace surround in what would be her husband's office. 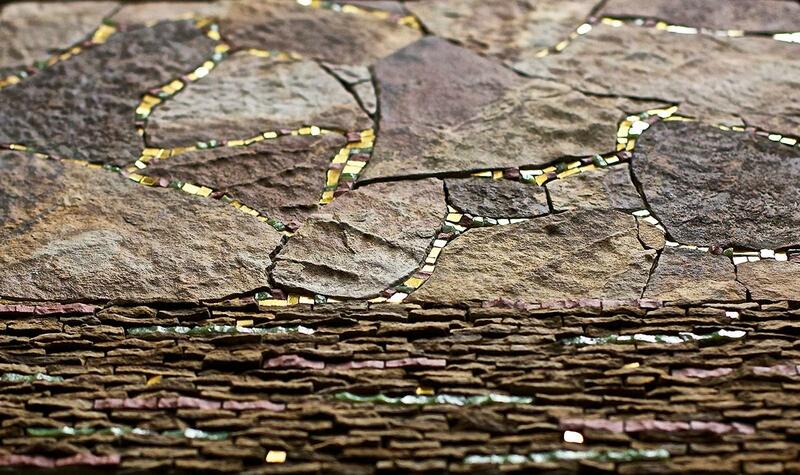 She found a local artist to make the mosaic, but she put her on her waiting list. In the meantime, she decided to start experimenting. Jacqueline: "After my first attempt, which was not too impressive, I was hooked." During her childhood she was not overly inspired by nature or landscapes. Jacqueline: "There was a good amount of turmoil in my family and I was not a very balanced child. Later, in early adolescence, our family spent a lot of time in the Missouri countryside and I found that solitary time in nature was a wonderful buffer for me. I still love the Missouri countryside. However, my main sources of inspiration are my materials, which include Italian smalti (glass) and gold, as well as Mexican smalti and stone, and also minerals. This year I have been working with some shale, which I have collected from our property here in Tulsa, Oklahoma. I have incorporated metal in a minimal way, primarily repurposing trash and framing hardware. I have not done much with wood, other than a small mosaic with a little piece of driftwood that I found in Hawaii. However, I have a couple of specimens just waiting to find themselves in a piece of art. I primarily do portable wall art pieces. 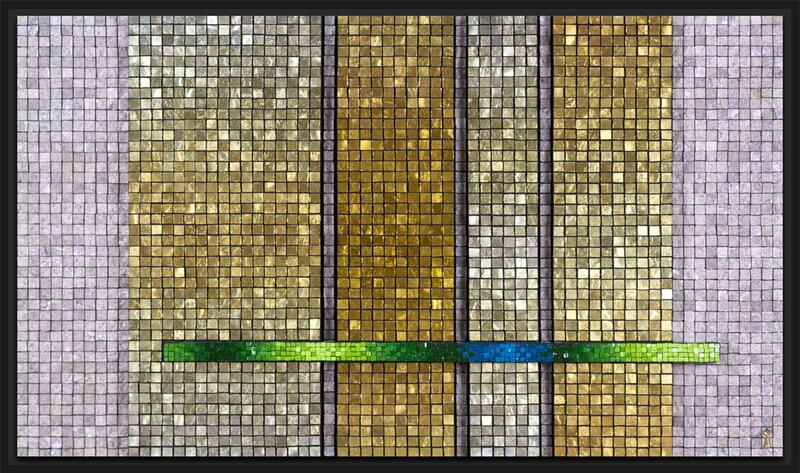 I have never done a floor mosaic, but I have done small architectural mosaics such as kitchen and bathroom trim, swimming pool steps and a bench and that fireplace surround in my husband's office. I also use fine materials. An integral element of my style is precision. I think that my work, via my style and technique, could be considered rather refined. Most of my work since about 2007 has been material-driven, conceptually abstract, and generally sober and contemplative. At the moment I am working on a rather large mosaic that is somewhat a departure for me. It is a rather fantastical tree with landscape, inspired by my impressions of the lower world of shamanic journeying." Although partly self-taught, she also studied at the Chicago Mosaic School and the Scuola Orsoni in Venice. Jacqueline:"In my early years books were my teachers. I intensely studied the techniques and cutting of the works featured in the books, and would then practice and 'copy' aspects of the works in my own projects. As I moved from hobbyist to artist, I began taking college-level art classes to broaden my artistic background. I experimented with different types of projects and different materials for about 10 years. In 2006 I went to Venice for an intensive 2-week Master Class with Maestra Antonella Galenda and Maestro Lucio Orsoni, at the Orsoni foundry. 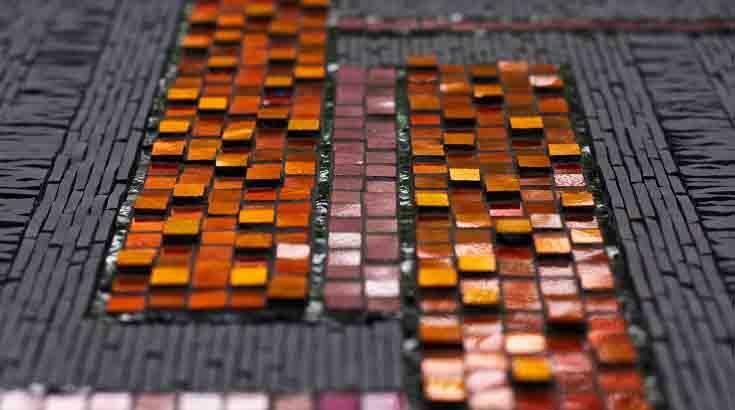 In the following years, I took a couple of intensive 3-day classes at Chicago Mosaic School, one with Carolina Zanelli of Spilimbergo, and one with Bill Buckingham/Sophie Droulin. I also took an intensive 3-day portraiture class at Maverick Mosaics in Vienna, VA, with Shug Jones. In 2009 and 2011, I travelled to Udine, Italy, for 6 weeks studying with Maestro Giulio Menossi. In 2010 I went to Turkey, Istanbul, for an intensive 1-week class with Sonia King." Sonia King is a great name in the world of mosacis. 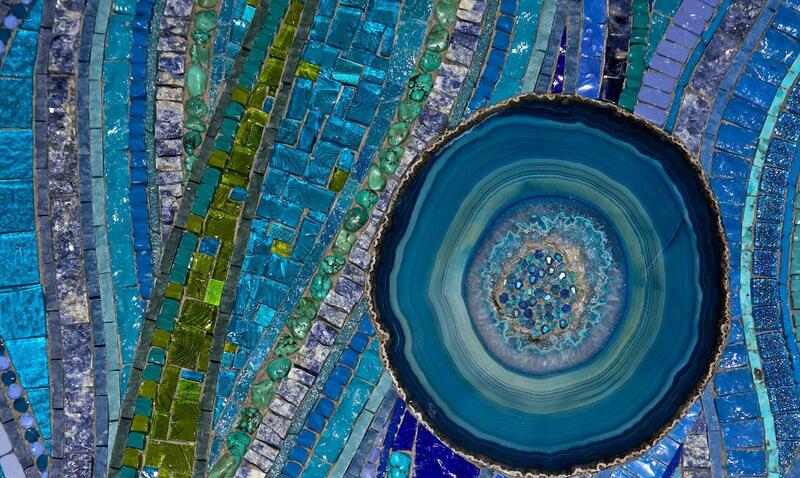 Born in 1953, she is a renowned mosaic artist, author and educator with studios in Dallas, Texas and San Francisco. Maestro Giulio Menossi started to learn the technique of Venetian mosaics at the age of 18. In 1979, Menossi moved to the United States to follow his passion for mosaic art and worked for the prestigious Crovatto Mosaic in New York. Upon his return to Udine he continued to improve his skill and techniques until, after 35 years of work, he became known for the high quality of his technique and design. Jacqueline Iskander photographed some of Maestro Giulio Menossi's mosacis for the book that she created and published for him, entitled "Menossi, i mosaici". She also created and published a book of food and drink-themed mosaic art with recipes contributed by mosaic artists. This was a collaboration with Pam Givens, who is the author of "Mosaic Fine Art Abstracts". Jacqueline is grateful to have travelled and worked with some of the great mosaic masters. Every teacher she had has offered her technical, as well as artistic advice. Jacqueline: "Maestro Lucio Orsoni instructed us to 'Think Mosaic'. This was a riddle to me at first, but it has led me to think differently about my work and to strive to master mosaic on its own terms, to create art that would not be as succesful in any other medium. Maestro Giulio Menossi taught me to be patient, very patient. It takes a long time to truly master a craft, if indeed anyone ever truly does. He also told me what his maestro told him: "Go into the studio every day and cut a piece, even if you cut just one piece." Jacqueline emphasizes the importance of a good technique and good materials to make a good mosaic. "I work directly on a substrate, using multiple cutting tools and wheeled nippers. Sometimes I use a grinder for fine shaping. My adhesive of choice is thin-set cement. Occasionally, I like to do a little decorative work, such as mirror frames or interesting bottles, using mirror glass and Van Gogh glass, both of which are similar to stained glass. For these projects, I use a glass scorer, a breaking tool and for example a silicone glue." "The materials I work with encourage me to express myself through their unique characteristics of texture, reflection and color. Those aspects of the materials inspire me, they give me ideas of how to use them to say something, or just to create a space for them to say something. "I start with the material and then the design comes from whatever it is in that material that is speaking to me or resonating with me at that time. There is something about the material or combination of materials that opens a door to my interior space from which there is something to convey, so I build a mosaic to convey it. That is why I say my work is material-driven rather than design-driven. I am attracted to the freedom and spontaneity that abstract art allows me. I draw as litte as possible so that my process is not overly subject to a certain design. 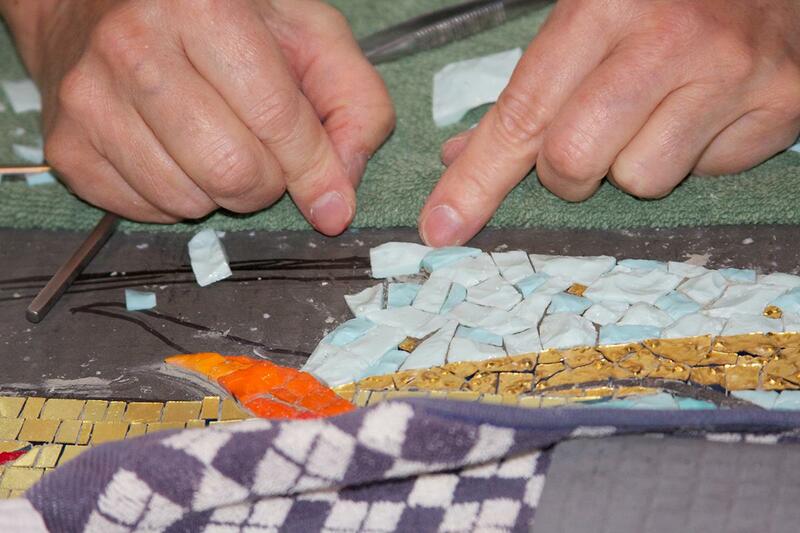 My primary creative activity is the physical handling of materials and building of the mosaic. It usually takes months for me to create a mosaic and working abstractly lets me be inspired by the materials and open to the energies and conditions in the present moment, to create a work that is reflective of a period of time, that is a testament to time lived during its creation." Jacqueline has participated in many national and international exhibitions. Last year she had her first solo exhibition with about 30 pieces, that ran for two months. Earlier this year she had a colloboration with Brooks Tower. "I am very proud of that exhibition we did together. I invited Brooks to join me in this exhibition in Tulsa, Oklahoma, at the Hardesty Arts Center, which is a stunning exhibit space. I was very excited to have a mosaic exhibition in my home town as there has never been one. Mosaic as wall art, as fine art, is quite obscure in this area of the country. It was a very succesful show." Jacqueline is very much impressed by the spirituality of the Byzantine mosaics. She explains: "I experience a state of awe in the old European churches and cathedrals. Those adorned with Byzantine mosaics certainly have a strong impact, which I partly attribute to the energy of the copious gold and the visual stimulation of the deep and rich smalti colours contrasting with the gold. Likewise, the stone floors and columns provide such a sense of grounding to me, keeping me rooted to the earth as the architectural details, mosaic and window light continuously draw my gaze to the heavens."